January 20th, we're celebrating 7 years of brewing in Indianapolis! We think we've learned how to throw a party, so to mark the milestone and thank our supporters, we are inviting our friends, partners, and loyal customers to join us at the Indy taproom for another epic Anniversary Party Beer Festival. Our brewers raided the cellar and are pulling out over 30 beers including a variety of barrel aged, limited, and specialty releases. We'll also have a limited amount of wax dipped bombers on sale. Bombers TBA. The party is always free with pints and half pints available for purchase, but attendees can choose to purchase a complimentary glassware/sample package. 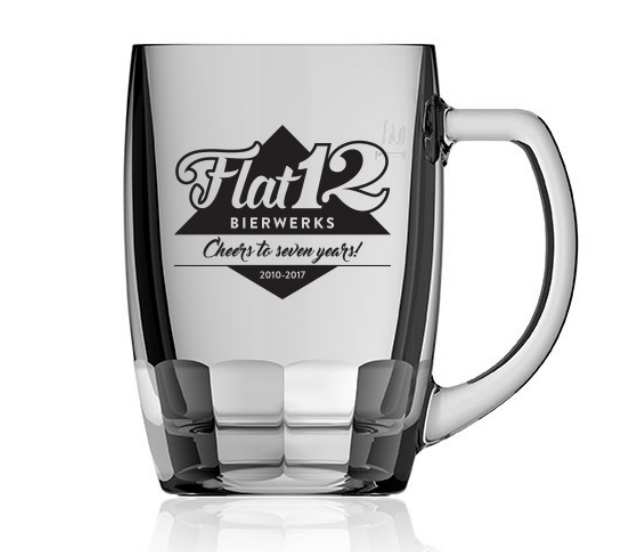 This $25 Anniversary package will include a commemorative German-imported Rastal Bamberg Tankard Mug with 3oz samples of all beers on tap for the duration of the event. Downtown Tinker Brown Coffee Brown Ale in collaboration with Tinker Coffee Co. Specialty bombers (quantities to be announced prior) will be available for purchase. * Please note, while we are usually dog-friendly, due to the high amount of traffic throughout the day and the amount of glassware, we do not recommend bringing them to this event.